Her choices from the chosen eligibles include a local carpenter who works in his father's very successful furniture company, a Silverwood philanthropist, the second son of the royal house of a neighboring kingdom (chosen mostly because he's the kind of candidate her father would obviously approve), and the fourth is essentially a random pick. She's stuck on who to make her fifth choice, and her father jumps in and suggests the very handsome Xavier, who seems rather oddly lacking in any very detailed background. Meanwhile, as the preparations for the ball went on, including teaching Charmaine how to eat soup without spilling it on a ball gown worth many thousands of dollars, she's met one of the kitchen staff, a young man named Cynder. Cynder is one of the Magi, a despised minority of magic wielders. They're heavily discriminated against in Silverwood, and ordinary humans fear that if they got more rights and freedom, they'd seek to take over Silverwood and oppress those without magic. With about half the palace staff being Magi, and her own movements outside the palace grounds being tightly restricted as a technically minor daughter of the king, Charmaine has been largely unaware of this discrimination, and to the extent she is aware of it, it's just how things are. Talking to Cynder is an eye-opener. They also fall in love. During the ball, a bomb explodes, and Cynder happens to be near the spot of the explosion, though not near enough to be killed. The Magi are instantly blamed, and Cynder flees for his life. But while Cynder is hunted and Magi are banned from the palace and driven from the kingdom over the next several months, the rest of the plan goes on. One of the chosen men leaves, but Charmaine still has to date the other four, and choose one. Xavier, of course, is not the one who leaves. 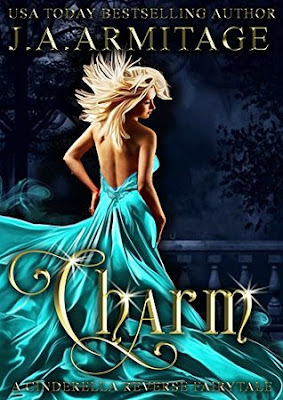 Charmaine is intelligent, but she's also inexperienced, naive, and trusting of her father. When the time comes for the first elimination, she chooses to eliminate Xavier. She still knows almost nothing about him, and he's made little attempt to charm her beyond his stunning build. Charmaine starts to really get to know her suitors, or at least three of them, and sees advantages in all of them. Xavier continues to apparently offer nothing but a gorgeous body and her father's inexplicable support. What's going on is an old scandal, and the reemergence of a temporarily submerged bigotry, and Charmaine, the daughter who never wanted to be queen, has to grow up in a hurry and tackle a bigger problem than she ever imagined. I can't really call this a Ruritanian fantasy, because there are no hints of the real Europe anywhere. This does seem to be a modern world with modern technology all around. It starts out seeming simple and superficial, but gets much more interesting, as do Charmaine and her suitors, as the story progresses. I'm glad I read it. Recommended if you enjoy modern fairy tale retellings.